Jake talks about why the toki blade is said to represent strength. Read the transcript below. Transcript: Jacob: "The toki kind of had two uses, traditionally. 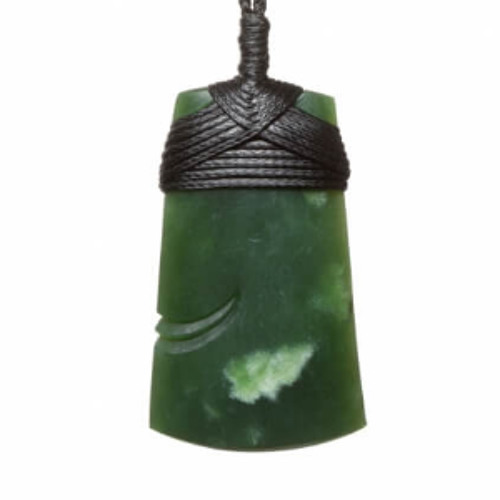 One was as an everyday axe, so the pounamu blade would be lashed to a wooden handle, and that would be sharpened to a fine point. And that would be used to carve waka, cut trees and things like that. Now the jade had to be really strong itself so that when it was being used it didnt break." Jacob: "Also, it was used in ceremonial axes. The jade in these axes was alot finer, alot more ornate, and couldn't actually be used to carve anything,to cut any wood, but it was held by powerful chiefs within the tribe. Only individuals with alot of strength, and alot of mana could wield these axes." Jacob: "So nowadays when people wear a toki around their neck, its a modern day things, it wasn't actually worn traditionally around the neck, it's said to symbolize strength because in its traditional uses, the jade itself had to be strong so it didn't break, and only strong individuals with alot of mana wielded the toki poutangata. So that's why, in modern times, people say that the toki represents strength."